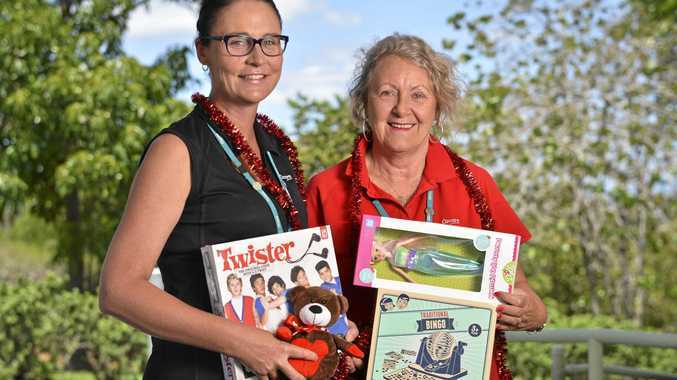 OZCARE has again teamed up with The Queensland Times to help needy families who are struggling to put food on their plates and presents under their trees as part of the Adopt-a-Family appeal. This year, there are 250 families who are in desperate need of 'adoption'. Schools, businesses, sporting clubs, gyms and organisations are urged to 'adopt' a family and provide a food hamper to some of Ipswich's neediest residents so they too can enjoy the festive season. Out of the 250 families who need assistance this Christmas, 27 of those have been nominated by Ozcare. Karen Roberts and Jo Witt from Ipswich Ozcare have seen first hand the high number of people who need support due to homelessness, drug and alcohol addiction or domestic violence situations. They have been part of the appeal for more than 12 years and hope the city's generosity will shine through to help some of the region's most vulnerable residents. "What people don't realise is, there is a very large disadvantaged population right here in Ipswich. There are so many people who are in real need," Mrs Roberts said. "Some families and individuals, through no fault of their own, are in these terrible situations and they desperately need our help. "Families we are helping through this appeal are significantly disadvantaged. They are in need of crisis accommodation, have no where else to go, have no one to turn to for help, have no belongings, have nothing to eat. "If we can get readers to help with the appeal, it will be a nice way to finish off the year." Suggestions to put in your hamper include long life milk, cereals, long life custard, tinned fruit and vegetables, tinned spaghetti, baked beans, pasta and pasta sauce, cake mixes, noodles, Vegemite, jams, honey, soft drinks, juice, cordial, coffee, tea, biscuits, lollies, chips, washing powder, toilet paper, soap, toothpaste, toothbrushes, shampoo, conditioner and deodorant. The QT Adopt-a-Family Appeal is now in its second week and there are still plenty of families who need your help. If you are able to help, get in touch with Karen McCoombes by phoning 3817 1786 or email aaf@qt.com.au.